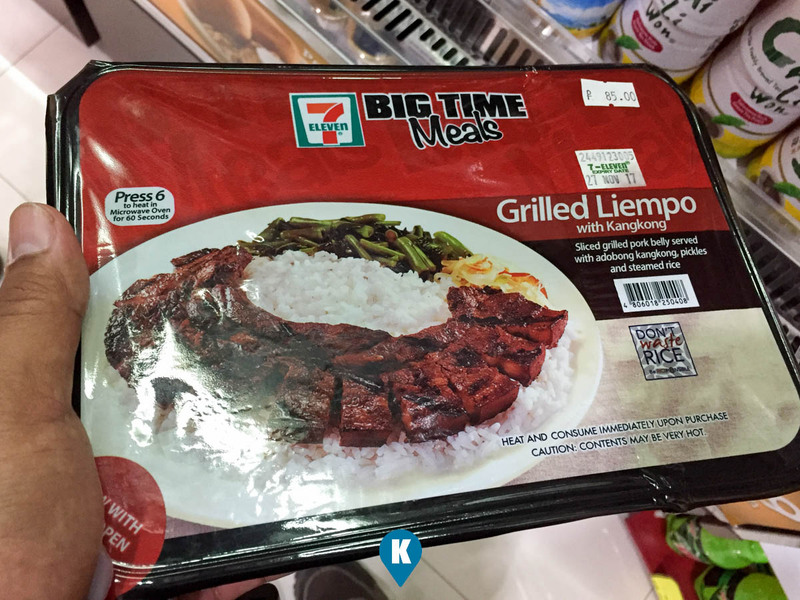 Finally I chanced upon the Big Time Meals at 7-11. This thing wasn't still being offered in the branch near me, so I was surprised to find in the 7-11 branch in City of Dreams (COD). We were just finished with one gig when we decided to eat first before going home. Being in COD, it posed a problem for dinner. Most shops in COD were of the high end types and this Katooga person is not comfortable with this. On our way out, we were like in a desert looking for water, trudging along with heavy feet. Then lo and behold we found water, an oasis amidst the ocean of sand, we found 7-11. As I was used to the smaller serving meals they offer, I accepted the fact I shall eat just to reach my house and eat again there. Then this surprise came. I saw in one of the refrigerated shelves the Big Time Meal. This one was the Grilled Liempo (Pork Belly). I was dumbfounded at first with the packaging. It had a black top cover with a juicy looking pork belly on the cover. It was charred nicely and it looked great. It had kangkong which I also liked so I know I would pick this one out. What made me doubt my choice was the fact I can't see what's inside of this thing. As they say, there's always the first time, I proceeded to the cashier to pay for this one. Asked the cashier to microwave for me and in seconds meal served. I then walked over to the nearest table and like an excited child opened the lid for my Big Time Meal. Then I saw the reality of it. The reality of the meal wasn't the same as with the illusion on the cover. 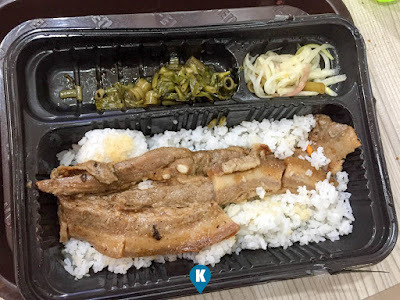 It didn't have the charred marks and the meat was tumbled along with the rice. Still I hoped that if i went passed the beauty or lack of thereof, the taste would win me over. It didn't. The Liempo tasted somehow like dried adobo, and although serving size was bigger than their usual meals, I felt I was shortchanged. The kangkong was not discernable as kangkong. I was surprised the green thing was kangkong and it tasted funny. I didn't eat this after tasting it. Then they have the achara or pickled papaya, which by the way didn't taste as such for me. Wait, was that achara? or is it something else? The rice was the worst I've tasted. It was so dry and almost crunchy. Imagine a crunchy rice. I assumed this was fried rice but the cover said steamed rice. What the .... did I just get? I do hope they would improve this as this looks promising. Lots of people work hard and they want to get their money's worth. Some people like me want to have a little more in life thus I chose the Big Time Meal. With an Php85 pesos price tag, I was hoping dining at 7-11 would be a good one at least. The opaque cover made me think that they were hiding the reality of the meal inside and I don't want to call it deceptive advertising but with what I got, I feel that it is.